eNews: Welcome to our 49th season! Since we initiated our "Spotlight on Alumni" program in 2003, the process of welcoming our graduates back to our stages has become an important part of our mainstage season. It's also become important to our current students who are eager to learn and work, side-by-side with alumni. We're proud of our multi-disciplined education that creates hard-working, creative and multi-talented artists, just like alumna Kate Braidwood of the WONDERHEADS. Read on to learn about Kate's experiences here at UVic and her unique career in theatre. 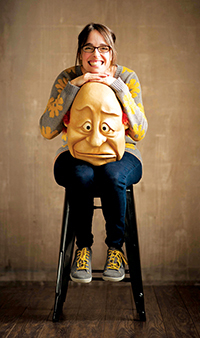 You might think that wearing a mask is a way to hide from others, but UVic Theatre alumna Kate Braidwood (BFA’ 03) discovered here at UVic's Department of Theatre that masks are a fun and engaging way to express herself on stage. Now, as the co-founder of the WONDERHEADS, Kate works with her husband Andrew Phoenix (what a great name!) to create playful characters through full-face masks and integrates these "wonderheads" into performances fraught with exquisite visual storytelling. 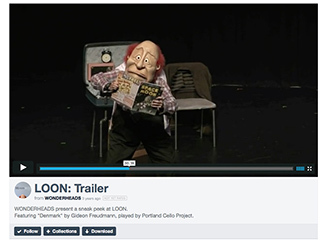 LOON, which opens the Phoenix Theatre’s 2015/16 season (October 14-24, 2015) is one of their award-winning physical theatre productions that this international touring theatre company is known for. It tells the story of Francis, a lonely janitor with a child-like imagination and a wild fascination with the moon. Unfortunately, Francis hits an emotional rock bottom and he feels like there’s nowhere to go but up, and up! And UP! You guessed it: Francis takes the audience on a journey to the moon! It’s a surprising mix of physical theatre, comedy, and pathos – all wrapped up in a peculiar, but beautiful, love story. 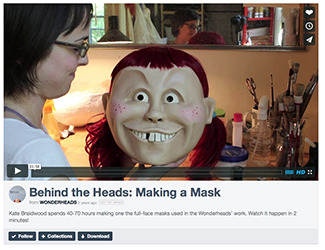 With their creative use of full-face masks, expressive physical movement and inventive lighting and sound cues in place of words, WONDERHEADS' shows have been compared by CBC Radio to watching "a living cartoon for lovers and dreamers." (Watch the online trailer!) With "Critics Choice" and "Best Show" awards from Vancouver to Orlando, they have been successfully changing audience's perspectives on the nature of theatre and storytelling across North America. Kate attributes much of her direction in life to her studies in the Acting Specialization. “My time at UVic played no small part in my journey that led to founding WONDERHEADS. 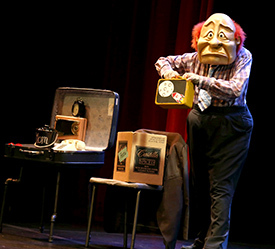 It was at UVic that I first performed with masks. I was lucky to have Peter Balkwill (of Old Trout Puppet Workshop fame) as a movement teacher at the time, and creating vocal masques in Jan Wood’s class shed light on the path to devising and creating my own original work." After graduating in 2003, Kate trained at Dell’Arte International, a physical theatre school in California, where she met Andrew Phoenix. “During the process of creating our first show together, we happened to fall in love. We got married, and when it came time to create our next show we thought “love” would be a fitting theme. LOON isn’t just about love; it’s also about loneliness, loss, and letting go. It’s about remembering how a person or experience helped shape who we are, and how we keep them in our hearts as we move on." As a Co-Artistic Director of her own theatre company, based out of Portland Oregon, Kate is also appreciating other aspects of her education. “The program at the Phoenix trained us to have a wide range of skills in the theatre, and the importance of being multi-faceted is integral for me today now that I run my own company." "When I moved on from the Phoenix, I kept the experience in my heart, and it is an honour to return to share my work with current students." & Andrew Phoenix of the WONDERHEADS. Performed in full-face mask, this wordless, whimsical love story will whisk you to the moon! Francis, a lonely janitor with a wild imagination and a fascination with the moon has hit rock bottom. There's nowhere to go... but up. And up. And up! NOTE: All performances will be followed by a talkback session with the artists. Performance is appropriate for ages 8 and up. Kate and Andrew will also be speaking about the various acting styles used when working with masks and how these influenced their work. Box Office is open for single tickets now. Three or four-show subscription packages for only $37.50 or $50 still available. 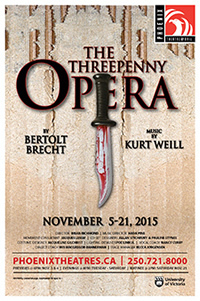 Brecht’s musical social satire is set in a dystopic future, where money corrupts & crime pays… still! Box Office opens for single tickets on October 27. Three or four show subscription packages for only $37.50 or $50 available now. Many Phoenix alumni and students were in Pick Of The Fringe-winning shows in Victoria this summer. Congrats to DamnSpot Theatre’s The Wyrd Sisters; Catador Theatre’s Two; and SNAFU Dance Theatre, TheatreSKAM and PUENTE Theatre’s co-production of Lieutenant Nun, which won multiple awards. 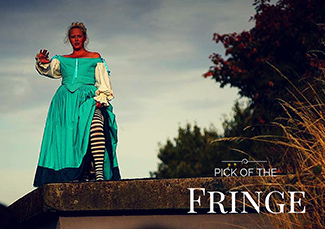 We’re proud of the almost 50 alumni and current students that were involved in 16 shows the Victoria Fringe this year! At the Vancouver Fringe, alumnus TJ Dawe (BFA’97) celebrated a whopping 20 years of Fringing by performing his best hits with a different show each day, including: Tracks, The Slipknot (performed as our Spotlight in 2003), Medicine, Marathon, Toothpaste and Cigars, (the play that the movie The F Word is based on), and his new show Burn Job. (Read more in this VanCityBuzz article.) 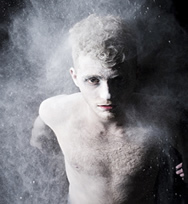 Also in Vancouver,TITUS: The Light and Delightful Musical Comedy of Titus Andronicus, a musical version of Shakespeare’s bloodiest play with book and lyrics by Andrew Wade (BFA’11), was chosen Pick Of The Fringe. 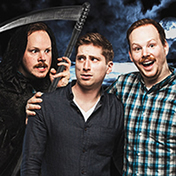 As was alumni Chris Wilson (BFA’08) and Peter Carlone (BFA’08), AKA Peter N' Chris, for their newest show Here Lies Chris, which will be coming to Victoria November 12 & 13 at Intrepid Theatre. Can’t wait! Another Fringe favourite, Sam Mullins (BFA’08), saw his new play Grandma’s Dead chosen for the Canadian Comedy Award for Best One-Man Show. Congratulations! In September, current student Colette Habel’s show SCAPE:Victoria was featured as part of the Intrepid Theatre’s YOU Show series. It featured alumni Levi Schneider, Nicola Whitney-Griffiths and Zoë Wessler. Earlier this month, Impulse Theatre celebrated it's fifth birthday! Since 2010, Artistic Director Andrew Barrett (BFA’12) and Impulse Theatre have created over 15 new works that bridge dance and theatre. Their celebrations featured performed excerpts of past works, many involving current students and alumni, including Tirades of Love, The Damned Girl, Wolf in the Mirror (which debuted as a SATCo), and #FALLOW. Congratulations Andrew! Alumna Amanda Verhagen (BFA’11) and UVic Writing instructor Daniel Hogg travelled to South Korea earlier this month for the world premiere of The Devout, the film they produced that was written by UVic Writing alumnus Connor Gaston! On a sad note this summer, the Department of Theatre lost an alumnus and a friend. Tim Sutherland, who received both his BFA in Directing and MA in Theatre History here at UVic, passed away on July 30, 2015. A lover of theatre and music, Tim shared his gifts as a writer, director and actor wherever he went. 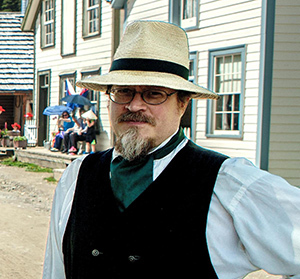 In addition to contributing to the theatre communities in Victoria, Vancouver, and his hometown of Calgary, Tim spent many summers in the iconic role of Chief Justice Matthew Baillie Begbie at Barkerville Historic Town near Wells. Always creating and learning, Tim was working on a new play and waiting to defend his Masters thesis in Directing and Theatre Production at the University of Calgary when he passed. His degree will be awarded posthumously this fall. Tim left a profound legacy behind for the Department of Theatre as one of the co-founders of the school’s Student Alternative Theatre Company in 1990. For almost 25 years, SATCo has become an invaluable part of the Phoenix’s educational experience, providing students the opportunities and resources to create theatre from the ground up as writers, directors, designers, crew and performers. Thanks to Tim’s efforts, generations of students have become better theatre artists. Thanks also to our supporters from the Cadboro Bay Village including: For Good Measure, Pepper's Foods, Smugglers' Cove Pub, Caddy Bay Liquor Store, Yew Tree Yoga and Heart Pharmacy.